Stage Management PIP Alex Kimmel offers a window into the Tempest rehearsal hall. Interns Katie, Jessica, Erin, and Alex at Haight-Ashbury. I’m Alex and I’ve just completed my first week as an SM intern at Cal Shakes! Three cheers to Erin, Andrea, Katie, Jess, Kendall, and Jessica—all the other interns—for completing their successful first weeks! And it has been such a fantastic first week. Just yesterday, we stumbled through all of Act I, and it looks fantastic. This comes as no surprise, but I am just overwhelmed by the talent and hard work everyone has thrown into this play. The play goes by quickly and is packed full of beautiful movement pieces, moving language, and lots and lots of charm and wit. Since internships are about learning I thought I would use this blog to share the lessons I have learned at Cal Shakes so far. Lesson 1: Cal Shakes folks are friendly folks! Smiling seems to be part of the dress code and everyone is extremely helpful (especially explaining how to properly use “Big Ricoh,” the printer). Lesson 2: Percolators make weak coffee… I have yet to discover the ideal coffee- to-water ratio in a percolator, and for that I apologize to everyone who drinks the coffee I make. I’m working on it, and it’s getting better (I promise)! Lesson 3: The nanosecond you take your eyes off the prompter’s script is the nanosecond that someone calls for line. Lesson 4: Glitter is fun but it’s a bear to pick up. Folding the glitter makes it easier and faster to pick up (thanks, Corrie Bennett!). Lesson 7: Actors are creative, witty people (see Lesson 6), and if you give them a prop of a roasted rabbit on a spit, they will do creative, witty things with it … primarily when they are on their breaks. Lesson 8: Scamels are delicious if you know how to cook them correctly. I hope you have found these lessons as valuable as I have; if there are any that you don’t understand, I hope you take it as incentive to come see The Tempest opening in just two short weeks! It’s going to be a magical show! Hello everybody! I’m Katherine, one of two education management interns in the Artistic Learning department of the California Shakespeare Theater. Working at Cal Shakes has been an amazing experience so far. Because I’m an arts administration intern, I spend most of my time working in our main offices, learning how to make all of our education programs run. We have a bunch of programs, mostly for students (Summer Shakespeare Conservatories, Student Discovery Matinees, assemblies, and classes), but also a few for the life-long learners in our audience, such as Inside Scoops and pre-show Grove Talks. With so many different programs, I’m always working on different projects, like running tech for an assembly or talking to parents about our summer conservatories. One of my toughest (yet most fun) projects was cutting The Taming of the Shrew down to a one-page version to be performed by our students before Student Matinees. It’s one of the ways we introduce the Main Stage plays to students—they perform the miniature version as fast as they can, get the gist of the major plot points, and then see the professionals do the show. Let me tell you, it isn’t easy to fit an entire play into one page, but I can’t wait to see how the students react when they attend the play in the fall. Even though I’m working in the office most of the time, sometimes I get to attend our educational programs. And the highlight of the summer so far has been working as a group leader at the Holy Names Conservatory. For two weeks, I escorted a group of 18 10- and 11-year-olds (known as the Riotous Knights) through busy days of classes and rehearsals. Although the camp was only two weeks long, the students were taught many acting fundamentals: improvisation, movement, voice/text, acting, Shakespeare history, and even some stage combat. They had a blast in the stage combat class—after all, what kid doesn’t love pretending to attack their peers? Especially when the fights were dropped into the wackiest scenarios: stolen cookies, lost shoes, even a few ninjas who can only move in slow motion. A good theater camp wouldn’t be complete without some crazy costume days. And crazy costume days we had, with Dress Like a Celebrity Day and Pajama Day. I loved Celebrity Day—of course we had several Justin Biebers (including a member of our staff), and a group of the eldest students came in full make-up as members of the band KISS. We had historical figures, musicians, even a cartoon character or two. On our Master Class Monday, the Riotous Knights had some brand-new classes: They learned about the art of storytelling and they practiced applying some specialty stage makeup. My group of 11-year-olds aged before my eyes when they put on old-age makeup. It was surprisingly effective; an hour after that class, I spotted one of the Riotous Knights down the hall and had to do a double-take. She truly looked like she was in her 70s! But the surprise of the morning was the class about Professionalism, when L. Peter Callender came in and discussed with my students how to pursue acting as a career. Some of the Riotous Knights just wanted to do theater for fun, but others had really intelligent questions about the business of acting. I was impressed by how seriously they took the class. Having just graduated from an acting school myself, I’ve been asking many of the same questions that they asked. But don’t worry, parents: The number one point they learned was that school has to be the first priority. playing those doors, trees, and caskets. The play was a complete success, and every student played a major role in the telling of the story. Our final performance went swimmingly and they had a ball being actors on the lovely stage at Holy Names High School. Absolutely, without a doubt, the most amazing part of working with the Riotous Knights over the last two weeks was watching them grow. I saw the shyest kids become social butterflies. I saw how their work as an ensemble transferred to all their classes and break-time conversations. I saw them make interesting choices, collaborate, and produce a piece of theater that they understood and wanted to perform. And best of all, it was fun! Learning, growing, and having fun: It just doesn’t get better than that. Internpalooza delivered on everything its name promised. Lots of interns. Lots of paloozing. The only things more gorgeous than the weather were the bright and smiley faces of eager young interns who, of course, always look that happy when asked to get up at 7am to hear lectures all day. But seriously, I enjoyed listening to all of our guest speakers at this second annual event, which Cal Shakes organized as a professional development opportunity for its own interns as well as those from Marin Theatre Company, San Jose Rep, Berkeley Rep, and Livermore Shakespeare. This year’s event took place at our own Bruns Amphitheater and featured presentations from experts in casting, fundraising, and other areas of the theater world. The highlight of my day was watching a staged reading of Toil and/or Trouble. The author, Lauren Gunderson, was present along with the director, Josh Costello. 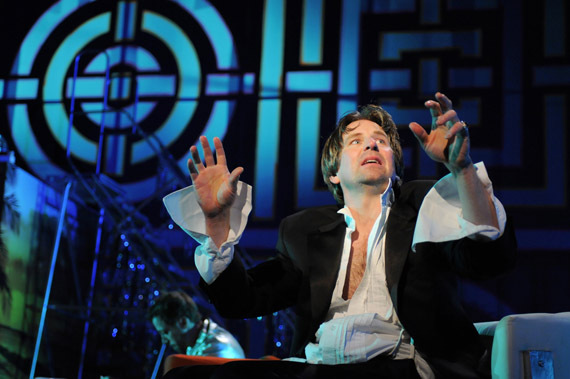 The cast included Michael Barrett Austin, who I had seen just days earlier in the Hapgood Theatre’s Imaginary Love. The show was a hilarious and modern take on Shakespeare’s Macbeth. The language used in the show bounced between very modern slang like “totes” to traditional original Shakespearean text. It was really incredible to be able to ask the author about her process and choices in the piece while examining the purpose and techniques for staging and performing a new work. As the actor who played Adam (Banquo/Macduff) said: “We cannot walk and talk at the same time. We have to choose one or the other.” The actors communicated the script beautifully despite the hassle of having a script in their hand. The takeaway points from the staged reading were: 1. You don’t have to justify anything. “Just because” is good enough. 2. Staged readings are a great way to get calls for jobs in full productions for actors. 3. Don’t fall into the trap of giving the actors too much blocking. 4. When you do readings you get to meet more people than you would doing a full production = connections = phone calls = paying jobs. I think I speak for all the interns when I say we were exhausted by the end of the day. We ate burritos and quesadillas in the grove and many of the interns stayed for that night’s performance of Titus. It was really nice to meet interns from other theaters and have a chance to network and make connections. 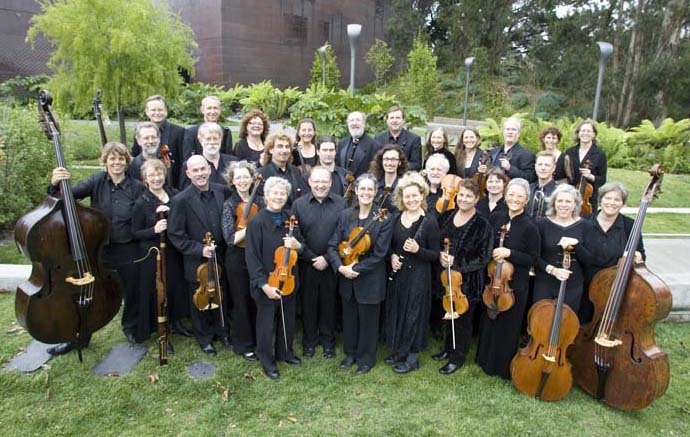 Don’t miss Stephen Barker Turner performing with the Philharmonia Baroque Orchestra! Thursday, February 5 through Sunday, February 8, Cal Shakes Associate Artist Stephen Barker Turner—who has portrayed, among others, Orsino in 2008’s Twelfth Night, Nicholas in Nicholas Nickleby, Orlando in As You Like It, and Posthumous in Cymbeline on the Bruns stage—narrates A Midsummer Night’s Dream to Felix Mendelssohn’s incidental music with the Philharmonia Baroque Orchestra as part of their “Midwinter Magic” concert. Music Director Nicholas McGegan will direct the period-instrument orchestra in celebration of the 200th birthday of Mendelssohn. The orchestra will be joined by the San Francisco Girls Chorus and other speical guests. Buy your tickets today! Visit www.philharmonia.org or call City Box Office at 415.392.4400. Photos, top to bottom: Stephen Barker Turner in Twelfth Night by Kevin Berne; The Philharmonia Baroque Orchestra by Randi Beach.